I survived my first week back in the office and it's finally Friday. I have never been so happy to see you. Being back in the office after being out for two and a half weeks is rough. Sure I had tons of emails to catch up on, lots of work to do, but jet lag kept creeping up on me. Anyways, let's get onto our Friday Favorites with Karli and April. One. We have family photos tomorrow. Finally. I am excited and nervous about it. Excited because we need updated photos of our cuties, but nervous because it is in between meals and they can get cranky and want their naps. Our pictures are scheduled for 9 am because the light is perfect then and we have a busy day ahead of us. I have our clothes mostly picked out, but hoping (more like stressing) that they go together. Two. That brings us to our busy day after pictures. We are taking the girls to my in-laws house for their first sleepover away from home. My in-laws are beyond excited. We picked up another pack n play from my aunt this week and now we just have to pack for the girls overnight trip. Why are the girls going on an overnight? Well Rory and I have a wedding to attend tomorrow afternoon and we don't want to come home (the reception is a mile from our house) slightly tipsy and worry about taking care of the girls. So we did the responsible thing and asked if the grandparents wanted a sleepover. It wasn't a hard sale at all. I received my dress a couple weeks back and I loved it until I tried it on when I got home from Tel Aviv and as Rory was zipping it up, the zipper busted. It zipped but had that gap in the zipper. I freaked out a bit, but managed to get it off and get it unzipped without damaging it. But I was worried it would happen again when wearing it. I contacted Lombard and Fifth and they were super sweet about it. They sent me a new one and the next size up just in case. And then I send the damaged one back along with the one I don't want and it is all free shipping. Amazing customer service. Three. Nordstrom is price matching Ray-Ban glasses and I really want to pull the trigger on these. 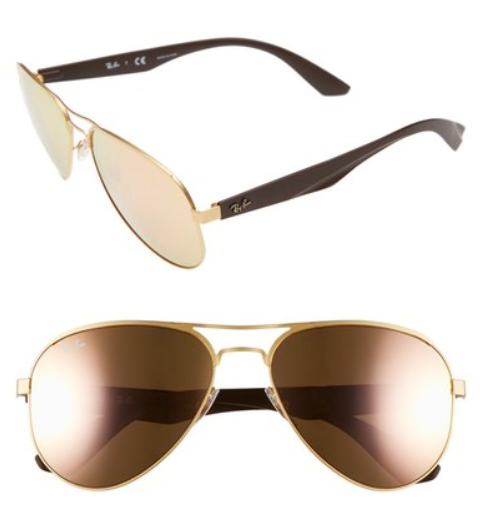 I loved my Ralph Lauren aviators and I tried these on and need them. And they are on sale. Should I? On sale for $116. Four. 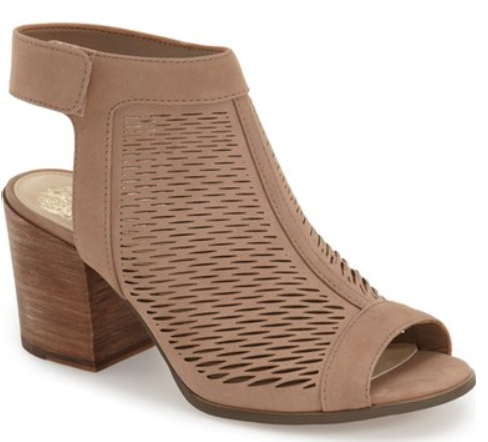 Speaking of more shopping, I want to get some peep toe booties or booties in a nudish color. I have my eye on these two. Need, want, must have. Five. I am on the hunt for a water table for my girls. I have looked a few up on amazon, but I want to hear which ones you have and ones that you love. I think my girls would love one this summer. Send me your picks. Six. I had to throw one more in here because I love this stuff. I know I have mentioned it before, but I love Maybelline Age Rewind Dark Circle Eraser. This stuff is gold. I never got dark circles until I had my lady babies. I tried to get by with a little concealer and then Jess (from The Newly) mentioned this dark circle concealer and I knew I had to try it out. It hasn't disappointed at all. I pretty much use this stuff daily and I am only a quarter through the bottle and I have had it for months. Buy this stuff. It is so much cheaper than the YSL stuff I was buying and works just as good, if not better. Oh no! I'm so glad the company is being so awesome about the stress. That's great. Can't wait to see it on you. Yay for their first sleepover. My kids have slept other places, but not without us. Cam had slept at home with Mimi AG our house when Emmy was born but that's it. The girls will have a blast. :) love those shoes. Have a great weekend! I am pretty excited to get all dressed up, have a night out with my husband and an evening away from the girls without worry of coming home to relieve the babysitter. Hope you have a great weekend as well. I'd kill to have my parents nearby for some babysitting! Tyler and I have yet to have a date alone:( I need water table recs too! Oh man, you need to find someone you trust to watch Wes. You need a date night alone! Can't wait to see your family pictures! Whatva great company! So glad it was able to get worked out! Thank you! Hoping the weather holds tomorrow morning so the photos are beautiful! Yay for grandparent sleepovers and fun at weddings! enjoy! We have a basic water table (I think it's step 2 and blue) and it's fine. I think more features would be more exciting. Hope your pictures go well! Good to know about the water table. I have two girls, so I need lots of accessories to keep them busy. I'm so glad you were able to get the new dress. I love it so much. Have so much fun at the wedding. I can't wait to see pics. We have the busy ball step 2 water table. It's basic, but the ball feature is fun for a little boy. Was the water table expensive? I definitely want one for the girls and a small slide to put inside. A few twin moms recommended it to me. Now the search is on. Thank you. It isn't often you get that sort of customer service. They rock and have beautiful clothing! So I was trying to not spend money... but dang you girl! Had to go and post those booties.. (the bottom picture) and I literally just went on their site and bought them!! So dang cute! Haha. They are cute and not that expensive. I want them as well. Need them more like it. I'm so excited to see all of your pictures! Hopefully they will turn out great! And yes to the aviators! Those are so cute. And you can never have too many pairs of sunglasses. I hope you guys enjoy your kid-free night!! I'm sure they will do fantastic! I think I need to get the sunglasses. I made some extra cash through overtime on my trip and I think those glasses are just what I need. Yes need because my others broke and I have to fix them daily. Can't wait to see your family photos! I've never heard of Lombard and Fifth, but what amazing service! I'll have to check them out. Love that dress! That dark circle eraser is a life saver! I have and love it!! Enjoy the wedding!! They are based in San Francisco and I am not sure how I came across them, but I love their clothes and have been eyeing dresses for this wedding and probably for the other wedding I am attending in July. Love the dark circle eraser. It is the best. Have a good weekend! Congrats on finishing that first week back, it's always the hardest! Hope you have a relaxing weekend with your sweet family! Thank you. It was a great weekend! I love those perforated booties!!! Good luck with family pictures! Me too. 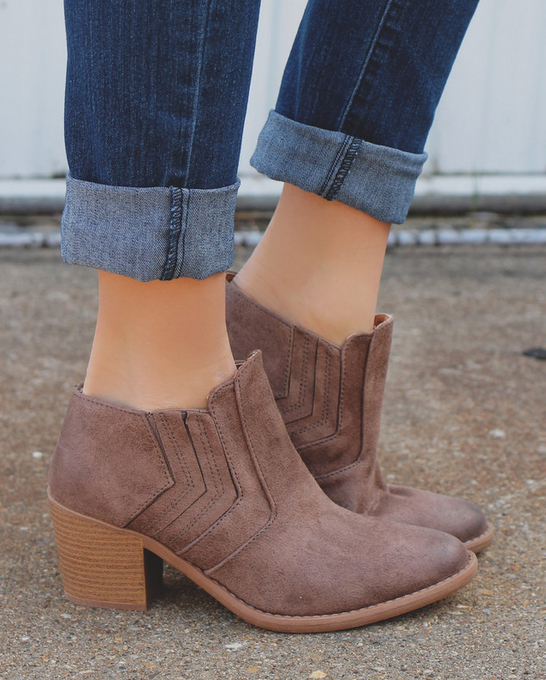 So many cute shoes out right now. We're taking our family pictures next week and I'm slightly freaking out too lol. Best of luck to the both of us! They are always so hard to take as my girls get older and older. Now they want to play, walk and crawl away from us. So much work. Best of luck! you should definitely snag those raybans! they are such a staple piece! treat yo'self girl! Can't wait to see your family pics! hope you have a great time at the wedding!! Thank you. I think I am going to pull the trigger on the sunglasses. I need some new one badly. I am very excited to get to see your family pictures, I know they will turn out great! Coordinating everything is definitely eventful!Great Friday post! Yes it is so hard to coordinate everyone's looks and hope for the best. Hope you had a good weekend. I want that dress and shoes please!! Haha, the dress was a huge hit. I recommend buying it and I love the shoes. I need to buy them.